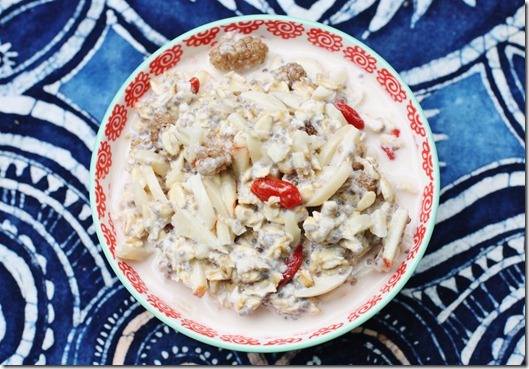 Raw, Vegan Bircher Muesli: Superfood Inspired! Did you know that Swiss physician Maximilian Oskar Bircher-Benner is thought by some to be the father of the raw foods movement? At his sanitarium in Zurich, Bircher-Benner encouraged his patients to eat less meat and bread and more raw fruits and vegetables. He also advocated strict portion control, as did his contemporary, Arnold Ehret, who is well known today for his administering of water fasting to sick patients. For better and for worse (better for the fruits and veggies and discouragement of meat, worse for the Spartan attitude toward eating) these men’s ideas are still deeply embedded in the language of raw foodism. And it is Bircher-Benner who invented muesli, a now ubiquitous morning cereal made of dry rolled oats, dried fruit, and nuts that remains popular worldwide today. I first heard of “Bircher Muesli” in one of Ina Garten’s books. From what I could tell, the thing that made it different from the muesli I was used to eating from a cereal box with cold milk was that it was soaked overnight in milk and yogurt. I’m not entirely sure that I have the distinction right, but regardless, I made the recipe as directed, with yogurt and milk, and I thought it was delicious. Though I make overnight oats and oat/chia parfaits all the time nowadays, I have never thought to recreate that wonderful dish in vegan form. Until this week. 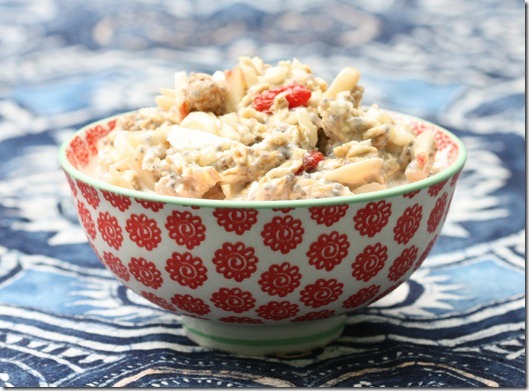 This breakfast bowl is an instant keeper. 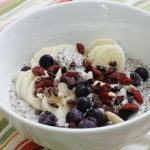 If you’re trying to go raw-er and you want a breakfast option that’s denser than a smoothie or a chia pudding, it’s a perfect option: though rolled oats are not technically raw (they’ve typically been processed under heat), they’re still uncooked, which will help you get used to cool breakfasts. 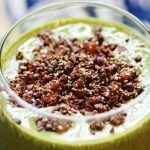 The meal is also packed with raw foodie staples like goji berries, mulberries, and chia seeds, which provide antioxidants and Omega-3 fatty acids galore. And if you make it with homemade almond milk, you’ll find that you hardly miss the rich, indulgent creaminess of a whole milk and yogurt base in traditional Bircher muesli. Although this is a very filling breakfast, it’s appropriately cool for the summer months. A typical summer dilemma for me is that I want the density and comfort of whole grains in the morning, but I don’t want hot food. Soaked oats to the rescue! 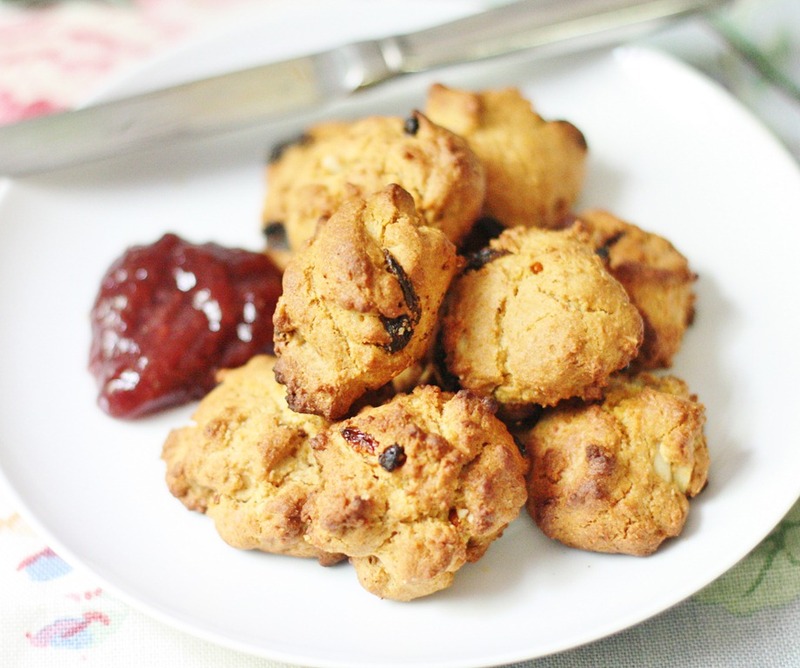 And if they’re imbued with tons of other healthy ingredients, well then, so much the better. Place all ingredients in a bowl and soak overnight. Dig into breakfast bliss. I don’t have much to say about this meal, except that it’s one of the most heavenly and satisfying breakfasts I’ve concocted in a long time. I hope you’ll all agree. I think your breakfast recipe queue just got a little longer. I was just wondering if you were on pinterest, and if we are able to pin your recipes? Thanks! I love your recipes!! Looks wonderful but PLEASE don’t resort to Pinterest.. it has to be the most annoying site ever invented! What kind of rolled oats do you use? New to raw foods. Can you be completely specific about the oats and if it matters? I assume you don’t mean Quaker oats….thanks! 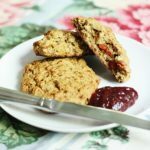 Good call on the make-ahead ready and waiting for you muesli bowl for the a.m.
And what cute mini scones! 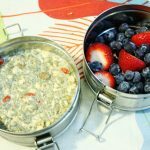 My mom always soaks the oats overnight, this is a typical European way of preparing oats…Not to mention soaked oats are much more flavorful, and healthier too. 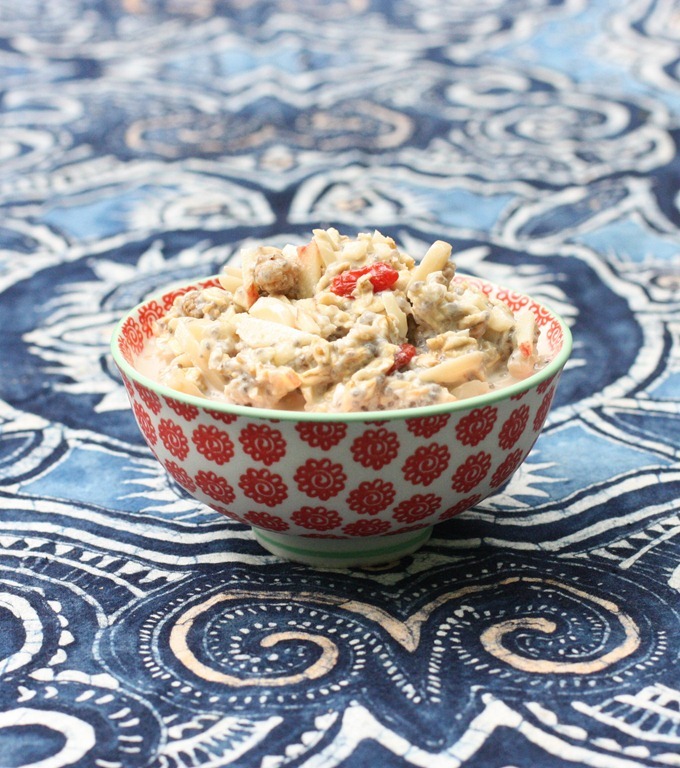 Thanks for the sharing this interesting blend of ingredients Gena, looks and sounds yum! Love love love muesli. I almost bought some at this organic discount store yesterday but the expiration date was like, August of last year. I know those things are exaggerated, but still, haha. And making your own = you get to choose what mix-ins you want! This could also be made with quinoa flakes for another gluten free option. I tried quinoa flakes instead of oats as part of my standard overnight oats rotation, and they work, but I found that they don’t absorb as much liquid, and they were a little bitter. You can totally adjust what you mix in (more chia seeds, more dried fruit, etc.) if you want a thicker texture and less bitterness. I don’t love quinoa flakes soaked — and I have tried to love them! As a side note, I wanted to tell you that my late-night final exam study snack is a raw kale salad. Thanks to you, I’m officially a convert! It’s funny, as Down Under (New Zealand + Australia) we call what you call ‘granola’ ‘muesli’…. and your ‘overnight oats’ are ‘Bircher muesli.’ Language quirks. I make bircher muesli for my non-vegan partner with yoghurt, so he call Bircher muesli “Bikram Yoghurt” as he says it makes him feel healthy like yoga (he has never done yoga). this post makes me nostalgic for italy! i ate a small bowl of museli everyday with my shot of espresso during a visit about wow..6 yrs ago already!! i haven’t had it since but this seems like motivation enough to put some together! i really am a textural person when it comes to food and i really appreciate something that has some softness but also the chew! looks like a hearty healthy breakfast! yes we are indebted to Bircher for raw foods and part of the health movement for sure. 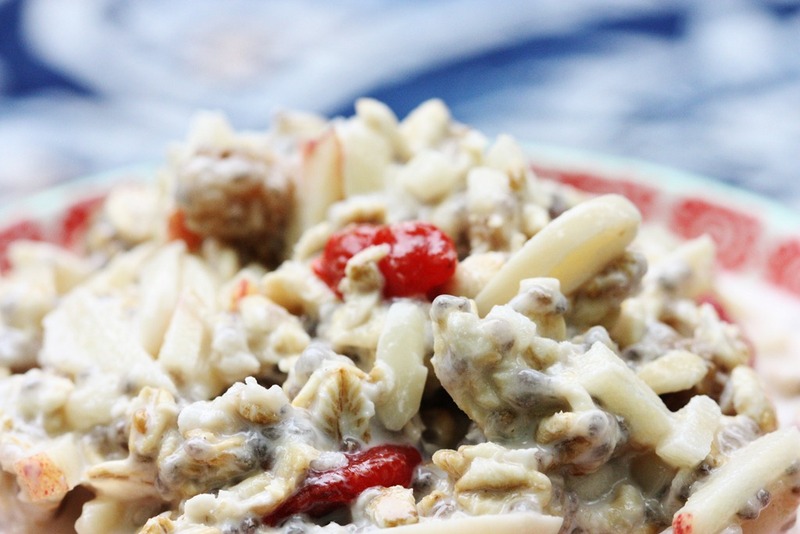 did you originally have homemade almond yogurt up there last night? or was that a hallucination of mine? I got excited about that. i’d love to make a yogurt myself that doesn’t involve opening a coconut or using cashews. I’m most certainly going to try this! Thanks for being so innovative- this is hippie-chic. Muesli is the lazy girls granola! I like these kinds of recipes, as with salads, because you can vary certain additions depending on the season and your own taste preference. A version using sprouted buckwheat groats would also be really good! I’m going to try both and report back! I just made this with a few substitutions this morning- I cannot WAIT to eat it tomorrow for breakfast!!! Looks and sounds fantastic! The perfect warm weather make-ahead breakfast. I’m curious… did you divide this into 2 servings or 3? I like a big breakfast and split my batch in 2. I’ve been reading your blog for a while now and, after a couple of years of flirting with veganism, have made the transition to alcohol, nicotine, caffeine, sugar, meat and dairy free. Never felt better. One of the things that I cannot let go of is my morning muesli. My mother used to make her own in the 1970″s and we kids thought it was awful but things always come full circle and I’ve been making my own for years now. Not being able to let go of my morning muesli has caused me a little guilt. I have a green juice every other day and wait until I’m hungry to tuck into my desert-island dish but I still feel like I should be having something other than muesli because most raw vegans seem to exist on juice in the morning. I’m delighted to read that others love it too and I’m not going to sensor myself unnecessarily from now on. After reading your recent posts on body image and the issues around ED, I think I should stop the self-criticism anyway, if muesli works for me. I make mine with raw oat groats which I soak for 24 hours and then mix with nuts, cashews almonds, anything I have really, sunflower and pumpkin seeds, goji berries and the odd sultana. I don’t seem to be able to get mulberries in England for a price that I can use every day. I then chop a piece of fruit in and use oat milk rather than any other milk because it’s cheap to make and tastes delicious. My heaven in a bowl! I grew up with parents who ate the traditional Swiss version often. I always found the version with yogurt off putting but my parents swore by that and their late morning carrot juice for a long time. To this day they are big on raw fruit at breakfast. when I got into raw foods my father pointed out Bircher-benner and how some concepts were similar. I think I’m going to try your coconut milk variation. This was fan-freaking-tastic! I wasn’t sure I was going to like it but I ended up inhaling my portion and stealing from my husband. When my daughter (2) asked for a taste I refused her. I’m not sure what it is about this dish but I love it. Before I went raw, bircher muesli was my favorite breakfast. Your superfood version is nice. You can get truly raw rolled oats and they are pretty good with an overnight soaking. Just a question – with soaking I thought you had to always rinse to wash off the enzyme inhibitors? Is it a problem then, to eat the almond milk that the oats have been soaked in? What if I had in chia seeds, quinoa flakes, or even buckwheat groats? I would love to know what the procedure would be. Thanks Gena! 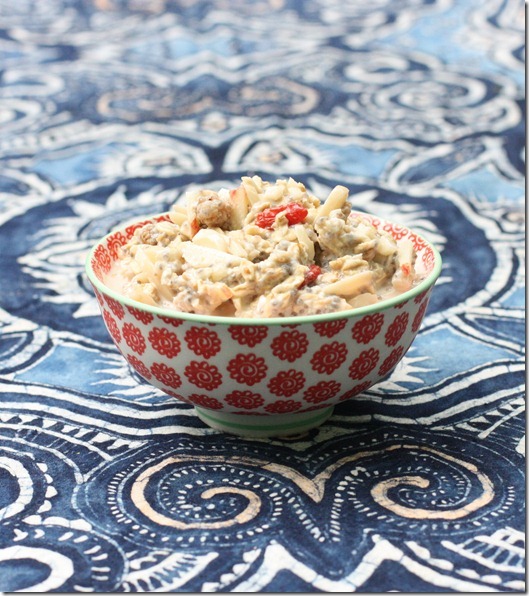 That’s funny, I made a vegan Bircher musulei for my cookbook. Great minds think alike! Yours looks lovely Gena. I also tried it with steel cut oats and I was not a fan…I know some people like it with steel cut, but I personally miss the creaminess of the rolled oats. By the way, goodluck when the finishing of your semester. I’m rooting for you! Hi Angela, i know your comment was from a few years ago but I was wondering what steel cut oats tastes like compared to rolled in overnight oats? Sprinkle ground nuts over dish. As you can see it is actually a fruit dish with very little grains in it. Dr. Bircher-Benner’s original recipe includes a Tbsp of condensed milk but it an be replaced with a Tbsp of natural yoghurt. I leave it out as I don’t animal products. With a little practise this meal is ready in 10 minutes. Since almost two years I eat Bircher Muesli every morning from Monday to Friday. The perfect thing is: you can change it in so many ways, add this, remove that and so on, so it will never be boring. I add the apple in the morning to have a “fresher apple taste”. 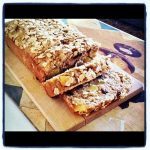 Can I use Irish oats for this recipe? 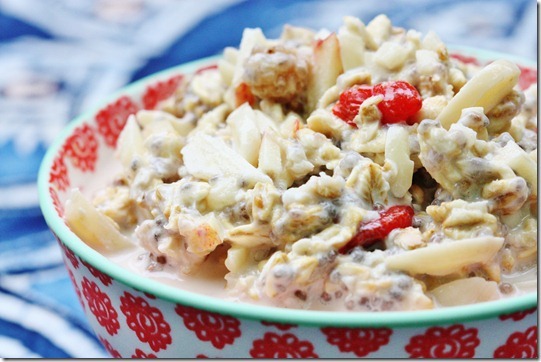 i LOVE bircher muesli! this looks great !! I’m pretty much in love with this recipe! 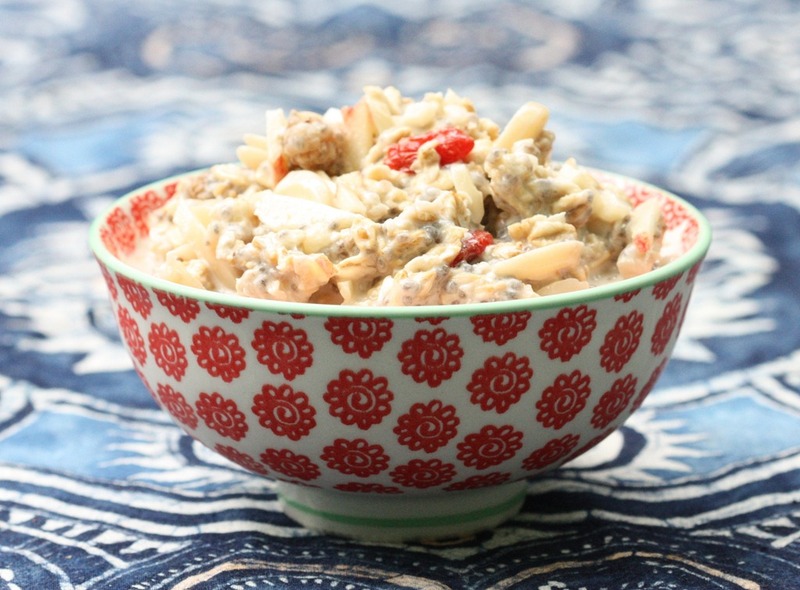 I’ve been having overnight oats for years, but the combo of everything in this muesli is simply perfect! Just made it! SUPER yummy! I added some cinnamon, coconut sugar, and a little liquid stevia so my kids would eat it better… a keeper for sure! Thank you so much!